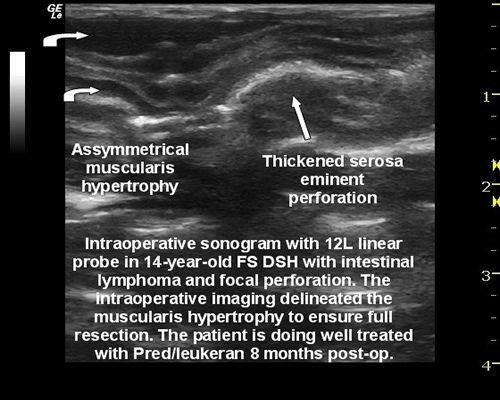 Intraoperative sonogram performed to delineate the extent of muscularis thickening within the small bowel in order to ensure full resection of the suspected infiltrate. Perforation of the small intestine corresponding to the region of bowel detail loss in image 5. This 17-year-old FS DSH presented for anorexia and weight loss. The physical exam revealed palpably thickened small intestine and mild dehydration. The original CBC revealed moderate leukocytosis with a left shift and mild anemia and the patient was treated with broad spectrum antibiotics. Ten days later the cat exhibited mild persistence of signs and recheck bloodwork demonstrated mild leukocytosis with mild elevations in BUN, ALT, and amylase. The T4 value was high normal with a severely elevated free T4. The coagulation panel demonstrated twice normal PTT and mildly elevated fibrinogen. Urinalysis: PH 6.5, USG 1.042, cloudy appearance, protein 1+, microalbuminuria twice normal. Hyperthyroidism, IBD, neoplasia, pancreatitis, tricobezoar. Intestinal lymphoma, mast cell disease,IBD, FIP, carcinoma less likely. Laparotomy was performed with intraoperative imaging of the intestinal tract in order to isolate the small intestinal thickening of the muscularis. A focal region of intestinal perforation was present without significant serosal changes and minor surgically palpable thickening of the segment in question. The surgeon resected of the portion of the bowel that contained thickened muscularis according to the intraoperative sonographer's direction. Full thickness biopsy of the small intestine with normal muscularis thickness was also obtained as well as mesenteric lymph node and liver. Samples were placed in separate biopsy jars and labeled accordingly as to the sonographic presentation. Histopath: Intestine with muscularis thickening: First read was interpreted as intramural lymphocytic enteritis with muscularis hypertrophy. 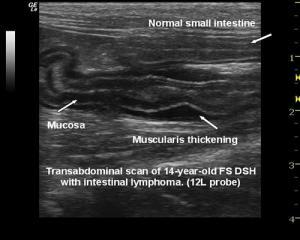 Second opinion interpretation: Low grade, diffuse, mucosal intestinal lymphoma with muscularis hypertrophy and mild multifocal submucosal and muscularis lymphoid infiltrate. Lymph node: low grade mast cell neoplasia. Liver: Moderate chronic lymphocytic hepatitis. After consultation with the pathologist, the hypertrophy of the muscularis was physiological in response to functional obstruction or a "pseudohypertrophy syndrome." Only islands of cross over infiltrative lymphoma were visualized within the submucosae and muscularis while the diagnosis was consistent with diffuse, low grade mucosal lymphoma typical of older cats. In his opinion, these patients tend to respond better to therapy and have a less aggressive form of lymphoma than the forms that involve the submucosal and muscularis layers in a diffuse manner. Since the regions of detail loss of the intestinal layers were minimal, physiological hypertrophy of the muscularis is most consistent with the sonographic presentation as opposed to infiltrative disease of the muscularis/submucosae. 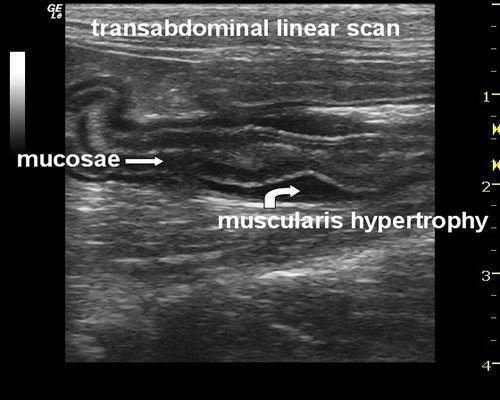 The minor areas of detail loss between the muscularis, submucosae and mucosae may have corresponded to the "islands" of cross-over infiltrate that the pathologist had described (see linear intraop. image 312L). Concurrent mast cell disease of the mesenteric lymph node was considered a complicating factor but would most likely not be treated differently. Regardless, the owner declined aggressive chemotherapy. The patient was prescribed an oral, bland chemotherapeutic protocol of immune suppressive prednisolone, chlorambucil and broad spectrum antibiotics. The cat responded well to therapy, gaining weight with a strong appetite 8 months post diagnosis. 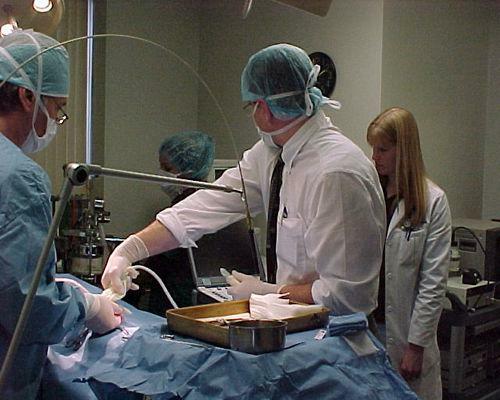 Referring Practitioner: Dean Cerf DVM, Ridgewood Veterinary Hospital, Ridgewood, NJ, USA.